For the non-African visitor planning a road trip in Namibia, Twyfelfontein pops up as a must-see in the literature, websites, and when talking with other travelers . 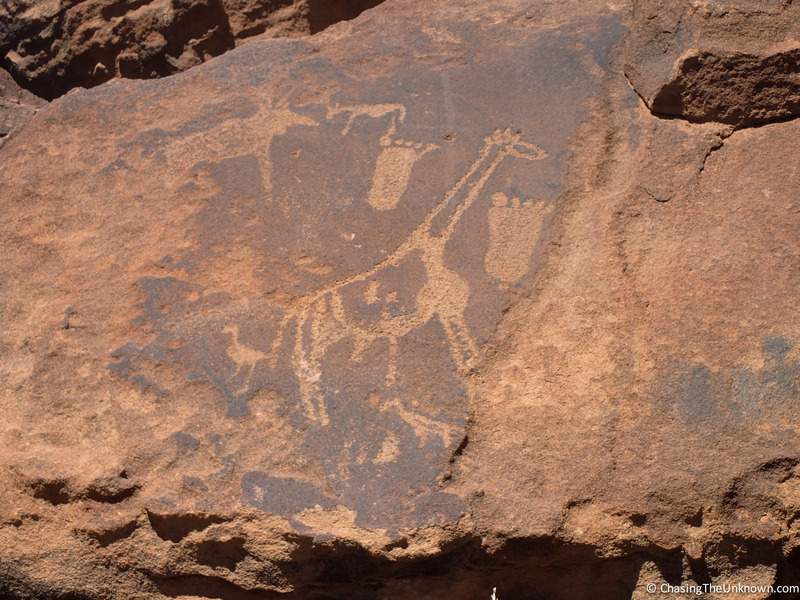 Home to one of the largest concentrations of rock engravings in Africa, it’s the only UNESCO-designated cultural World Heritage Site in Namibia. Yet when I talked to South Africans about where to go or where they’d been, they mentioned Spitzkoppe and Brandberg, both in the same region, but routinely failed to include Twyfelfontein. Brandberg is home to the White Lady, a rock painting of great renown that early scholars believed was influenced by European or Mediterranean ties. 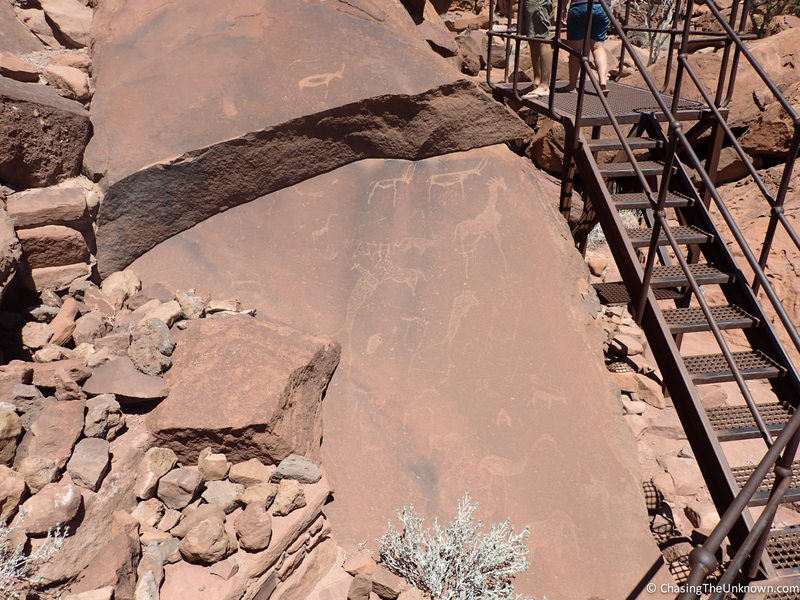 More recent scholars concur that, like all the other rock art in the region, there was no European influence. I didn’t make it to Brandberg so if you’d like an account from an American woman who did, check out this piece. Spitzkoppe is the Matterhorn of Africa, so-called because it allegedly resembles the Swiss mountain. I’m not entirely convinced by the reference. Of perhaps more interest than the Matterhorn comparison, Spitzkoppe is home to a beautiful campsite and at least 37 ancient rock art sites. None of the guide books I consulted sold me on Spitzkoppe but my South African traveling companion had her heart set on spending a few nights there. Mine was set on Twyfelfontein. We managed both. 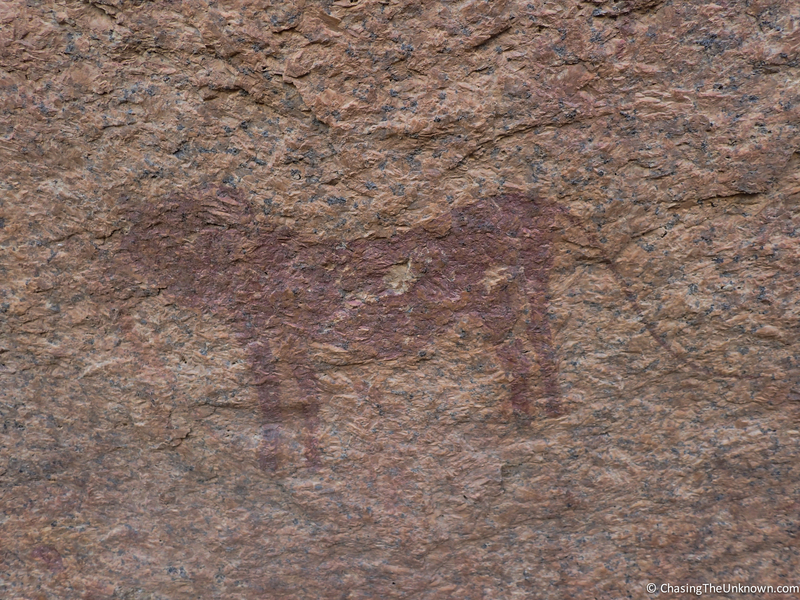 In the end, Spitzkoppe wound up one of my favorite spots in Namibia while Twyfelfontein was one of hers. 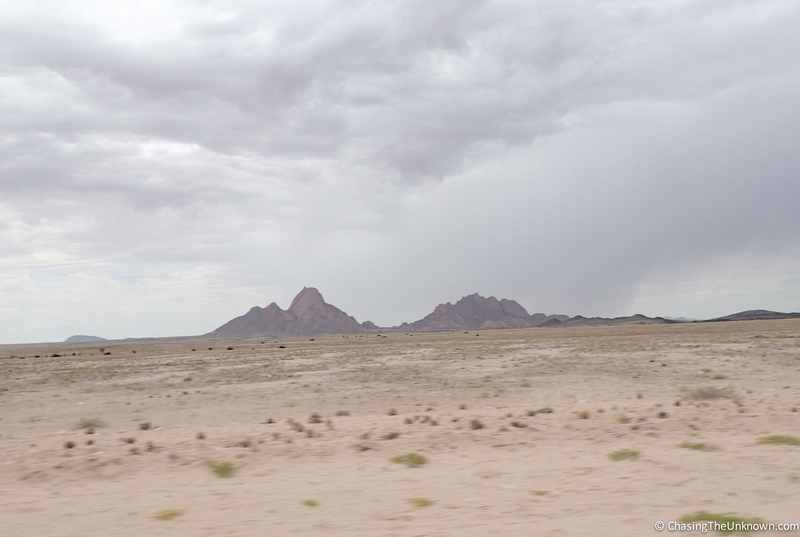 We approached Spitzkoppe from the West, having woken up on the Skeleton Coast. The day was overcast and we had a few moments of rain throughout the morning. The drive from Henties Bay meant taking D roads all the way. D roads are the least maintained of Namibia’s “main” roads; one step up from ungraded farm roads (F or P). Driving a 2WD sedan along such roads is generally not recommended. But if you can tolerate bumpy corrugated gravel and dirt, routinely check and adjust tire pressure, and know how to change a tire, it’s manageable. With low clearance, there are some roads best avoided but the D1918 and 1925 were fine when we came through. The drive was, unusually for Namibia, a bit dull. There were no bright red sands in this desert, no lichen to marvel at, and the scenery was monotonous. Until Spitzkoppe and its neighboring peaks appeared. As we approached, untended tables covered in rocks and minerals popped up along the roadside. When we turned toward Spitzkoppe Campsite, the tables became stalls and children started waving. These were Damara, traditionally makers of glass and metal works, leather goods, and more. The children ran into the road, some dangling necklaces from their outstretched arms, hoping we’d stop for the crafts and stones sold by the women sitting in the shaded stalls. I’ve encountered countless scenes like this around the world but this one felt more sad than usual. It was low season for tourists in Namibia and few people came through with money to spend. The desperation on these children’s faces was striking. I never know how to handle these moments. I don’t have a home to which I can take trinkets or crafts nor do I have the space to carry such things. I don’t wear much jewelry and even if I did, how could I decide which family to buy from? For better or worse, we drove on, choosing to not stop. Our home for two nights was Spitzkoppe Campsites. Run by the local community, I at least felt good about supporting area residents by staying there. The site is well run and home to some gorgeous campsites. My only complaint is that a guide is required to visit some of the rock art but none were willing to accompany us on foot. We didn’t want to sit in the car with a guide squished in with us. The camp’s website and guidebooks state that guided walks and hikes are available but, perhaps because it was low season, we found this not true. So we walked to areas where one can go unaccompanied but quickly grew frustrated at the minimal areas this encompassed. At least we saw the paintings at Little Bushman’s Paradise. 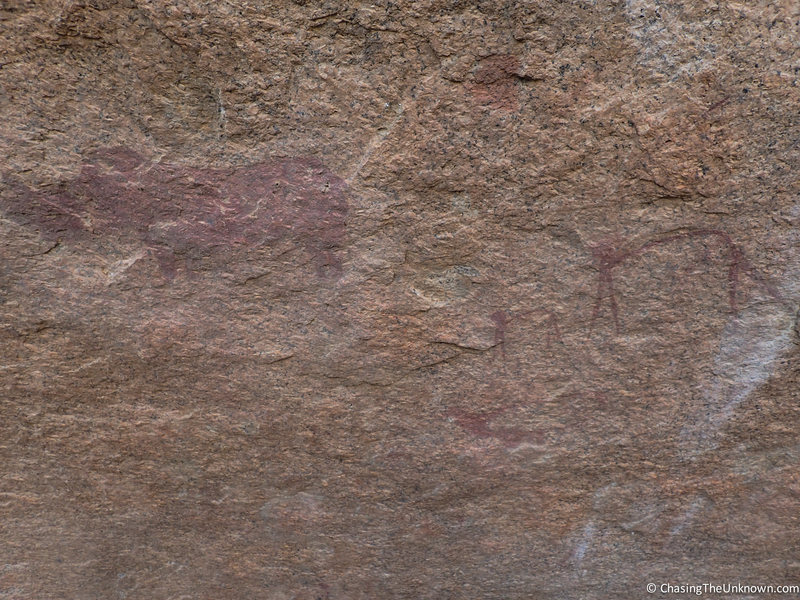 The rock art at Spitzkoppe is believed to date back 2,000-4,000 years and the bulk of it is within Bushman’s Paradise. Without a guide, we weren’t allowed to visit. Regardless, our time at Spitzkoppe was wonderful. A full moon and thick blanket of stars lit the night sky, even after a cloudy sunset. 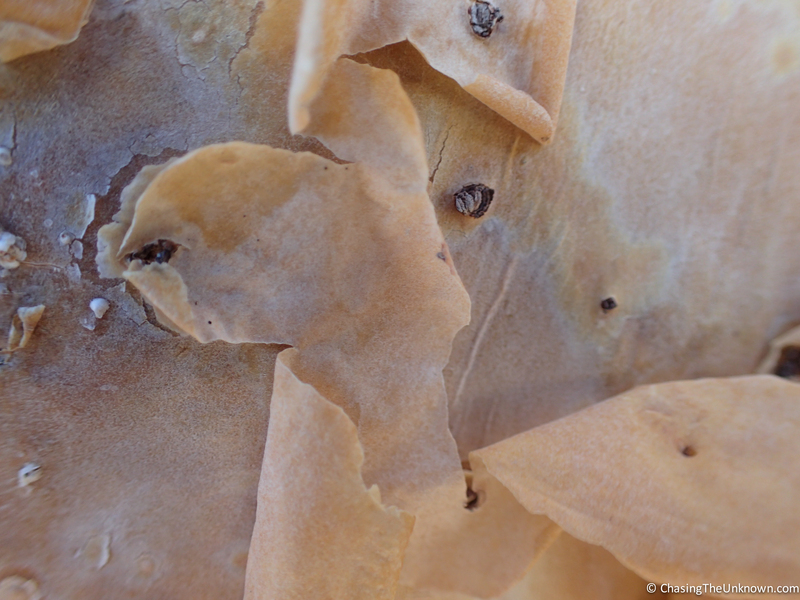 We scrambled around rocks, watched lizards at the rock puddle, marveled at the papery bark of a cyphostemma tree, and reveled at being back in the hot desert after our cold nights on the Skeleton Coast. 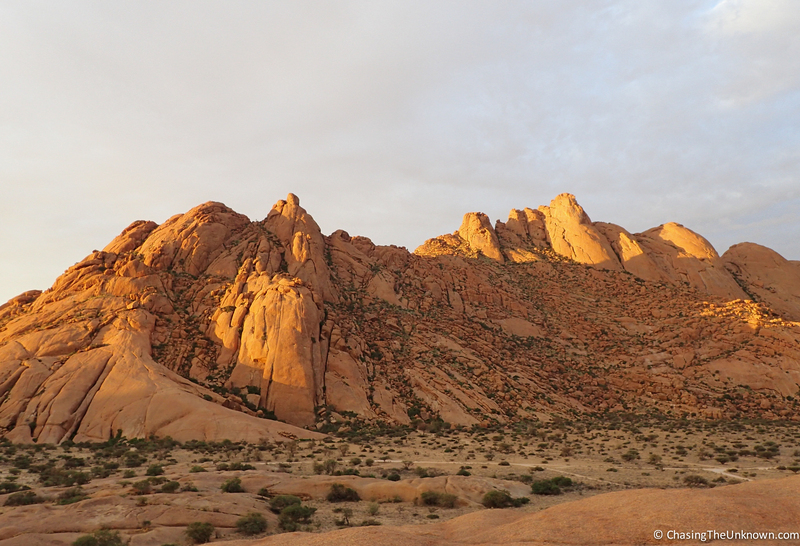 I can’t really explain why Spitzkoppe was such a pleasant surprise for me. Maybe it was the full moon, the lovely outdoor shower after days without washing at the Skeleton Coast, the joy of being back in the desert, the silence and peace of isolation, or something else altogether. 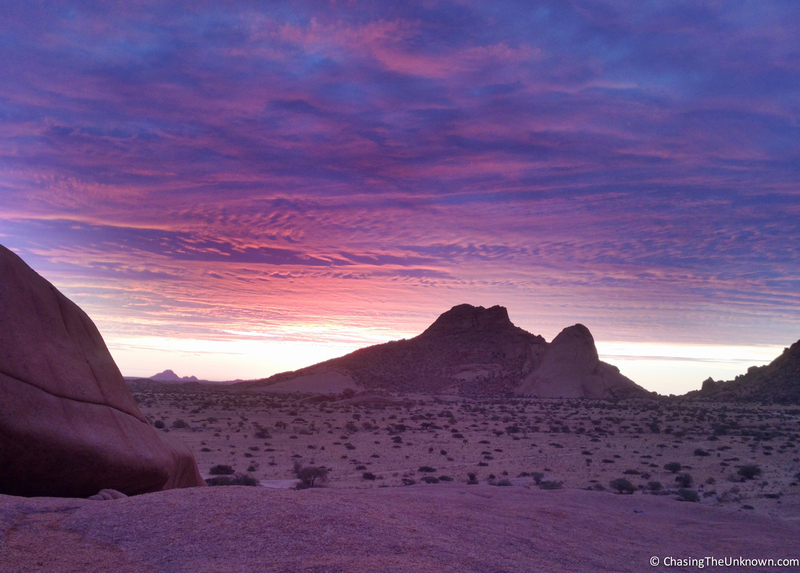 Whatever it is, I’m eternally grateful to the South Africans who suggested Spitzkoppe. Our visit to Twyfelfontein should have been a day or two after Spitzkoppe but a flat tire on our way out of Spitzkoppe caused us to reroute. For anyone traveling that way, consider yourself warned: the D1930 between Spitzkoppe and Uis is a terrible road with large, sharp rocks. It’s little-used so if your car breaks down, be prepared to wait overnight for help. Also, let air out of your tires when you reach really bad roads like the D1930. Ask locals for guidance on what your tire pressure should be for a given road then make your own call based on your car and the weight it’s carrying. Ok, public service announcement complete. Moving on. 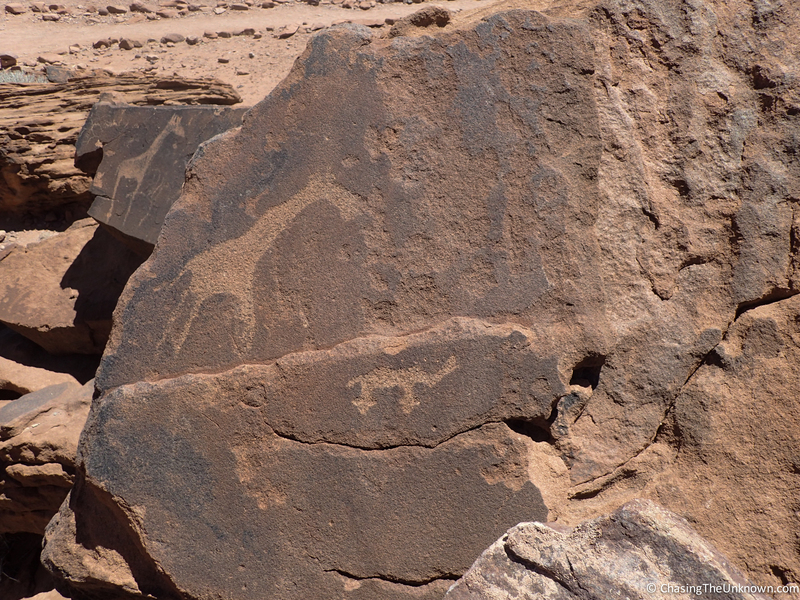 Rock engravings are the main draw for Twyfelfontein and they did not disappoint. 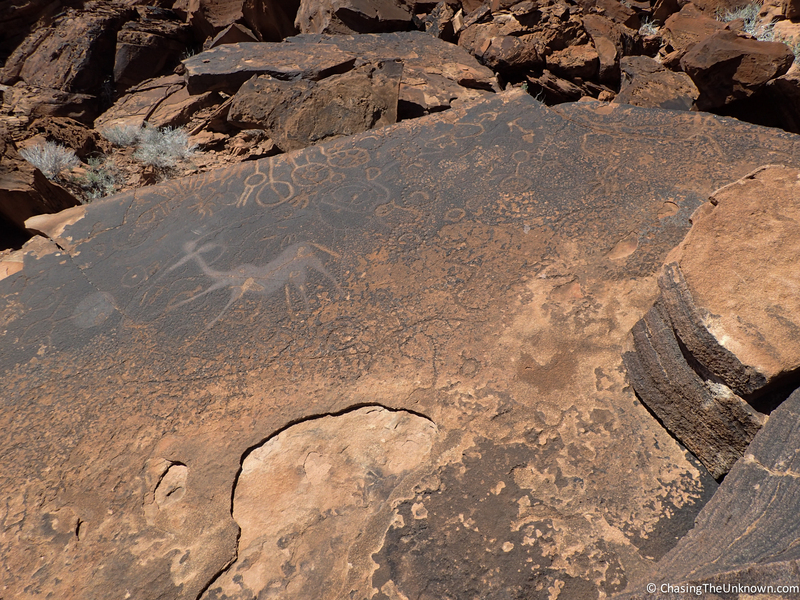 Ranging in age from 2,000 to 6,000 years old, the engravings are credited to the San hunter-gatherers (a/k/a Bushmen). Some may be maps, showing the location of waterholes. Others might constitute ancient chalkboards for educating children about the animals, their footprints, mating patterns, and more. One, a lion with a long tail and a human hand at the end thereof, represents a shaman. 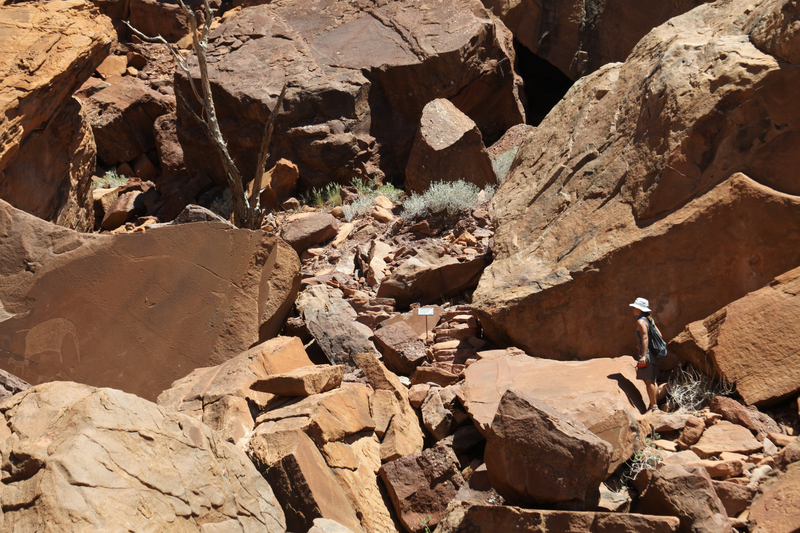 Visiting the rock art at Twyfelfontein requires hiring a local guide and is done on foot. The site is well-organized with footpaths, staircases, and viewing platforms that get visitors closer to the engravings. 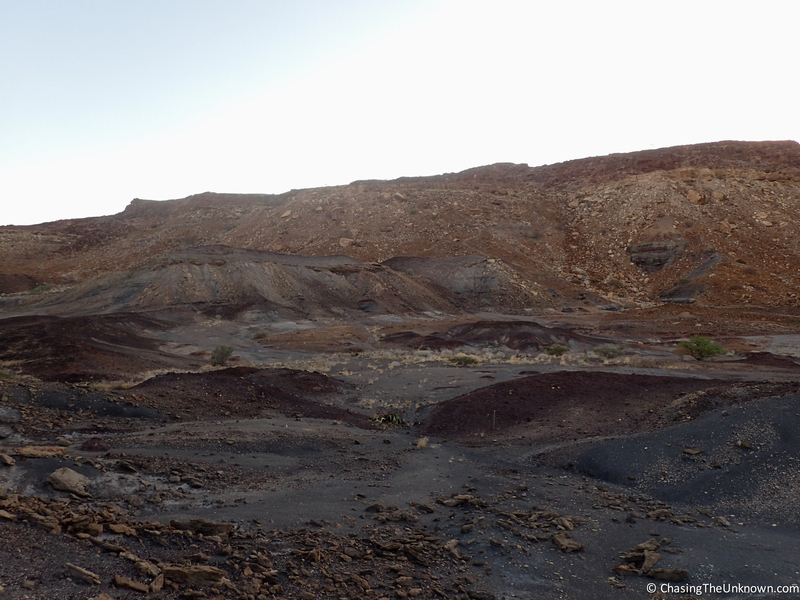 Spending two nights in the Twyfelfontein area gave us time to see desert elephants, walk to the Organ Pipes and Burnt Mountain, take long walks (or, in the case of my traveling companion, runs), and chat with the young team running the campsite we stayed in. It was here on a solo walk that I first saw a young springbok spronking. The height the young buck got with each leap was incredible. 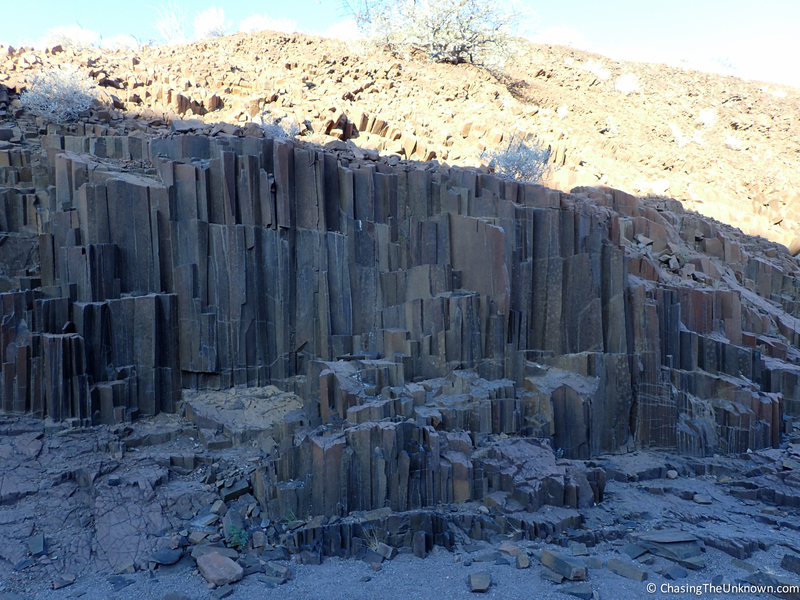 The Organ Pipes are columns of dolorite, likely formed 120 million years ago. Burnt Mountain is basically a mound of black shale. Apparently if the sun hits it just right, it looks as though it’s on fire. We tried to catch the late afternoon light, alleged to produce that effect, but were a hair too late. Regardless, the spongy ground was fun to walk on and spotting Welwitschia plants was an unexpected pleasure. 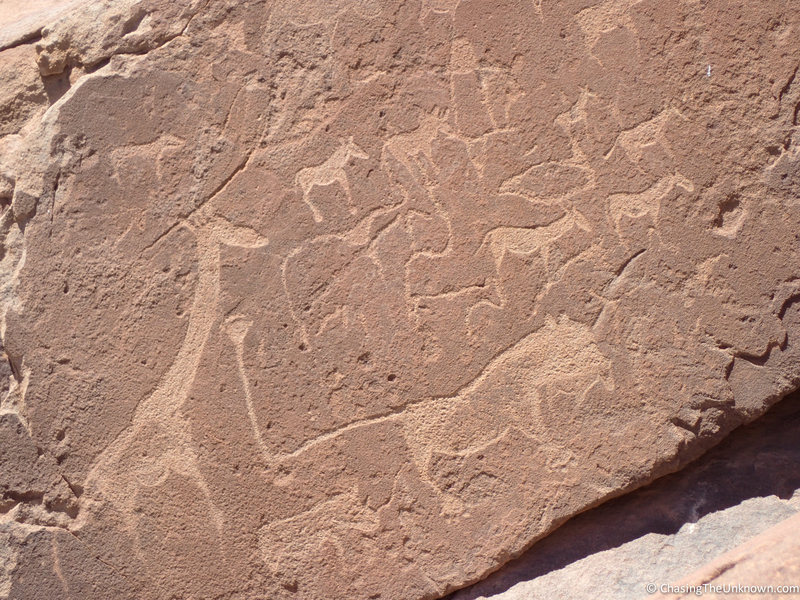 Twyfelfontein is deservedly on the international tourist trail in Namibia. 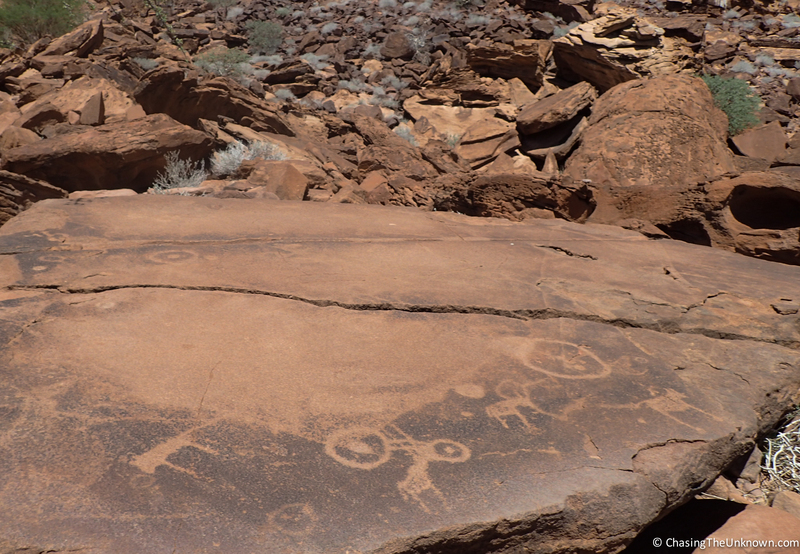 The rock art is well-preserved and easily observed once you survive the gravel roads. Desert adapted elephants like those we saw can, I’m told, almost always be seen in the area. It didn’t have the same je ne sais quoi for me that Spitzkoppe did but I highly recommend a visit. If time allows, put both on your itinerary!